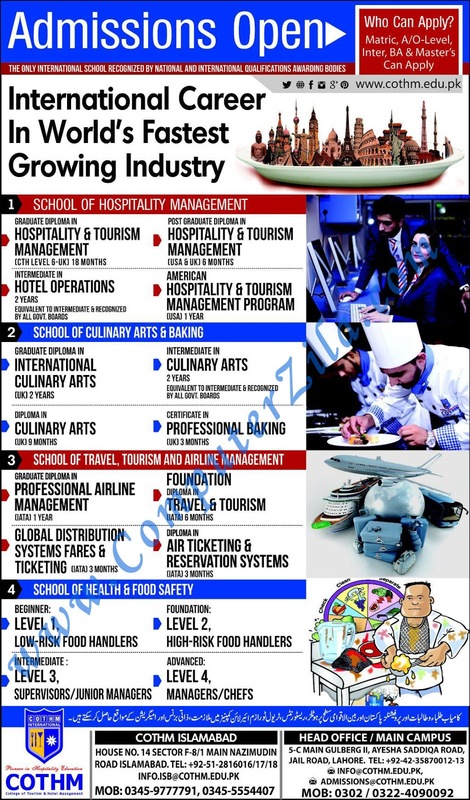 Admissions Open at COTHM College of Tourism & Hospital Management's Islamabad and Karachi Campus for the batch Spring 2018. COTHM offers admissions in different fields of study for Masters. you can apply for , M.Sc. - Master of Science, . This Industry Is Global And One Of The Biggest Employers In The World. Out Of Every 100 People, 10 Are Employed In The Hospitality Sector. But There Is An Immense Shortage Of Skilled Workers In The Field, Creating Numerous Employment Opportunities Annually For Ambitious And Career-Oriented People Across The World. University Address 14 Sector f-8/1 Main Nazimudin Road Islamabad.